I know, I know. Hiatus is a fairly lax word for what I've been on lately. Sheesh. Rather than apologize and tell you all that its going to change, here's a swimming suit that I made a couple of years ago and just got to wear this week. I know, pretty weird, but that's my life. It's really crazy how satisfying swimwear can be to sew. I highly recommend. This is my second Burda Style Alison and I'm happy to say that I'm completely satisfied with this make. Oh I love it so much I could cry! It's absolutely perfect! Ha ha! 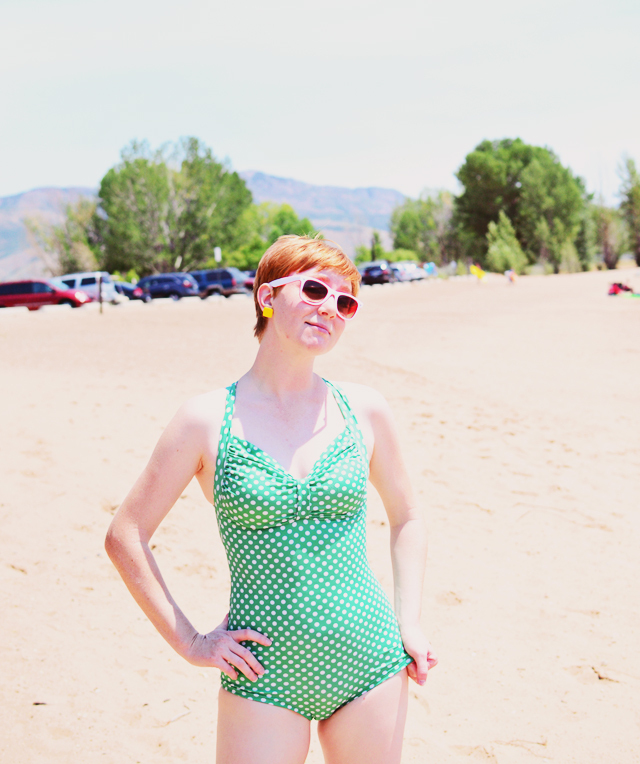 I've been waiting my entire life for this swimming suit and yet, it took me two years to wear it. Sigh.... Yes. Anyway, now that I've all made you seriously green with envy (that pun is sooooo totally intended too) let's talk shop about this pattern. My previous version of this pattern was still too short in the torso. When I did my previous version I added 1 1/2" length to the crotch depth. For this version, I raised the bra shelf 1 whole inch and that friends is pretty wicked. In total there is 2 1/2 inches added to the front (I wanted to keep the back where it was, so I only raised the portion above where the back of the suit connects to the front at the side seams). I've never had to add that much length to a sewing pattern before. I mean, I thought I was long waisted but now that I really think about it, I'm more convinced that this pattern is very short in the torso and I'm even more convinced of this having gone through several of the photos on BurdaStyle of this suit. It's even rather short in the torso on the original model. For this version, I reincarnated the neck strap. I got rid of the back strap across the middle of the back and instead cut 2 of the neck straps, stitched them together and added a really really long strap to the neckline area. From there I tried on the suit, criss-crossed the strap in the back and attached the strap ends where the original horizontal back strap would have been. In my opinion, this is so much more comfortable than having that neck strap around my neck - I HATE that because it just digs into the back of my neck the whole day long. The strap also gives the perfect amount of support to that bustline now too. In addition to this change, I added regular old 1" braided elastic to the entire strap. I found on my previous make of this pattern that the strap really lacked.....something and it really needed stability of some sort. Since you can't really interface a knit that is supposed to stretch like this, the next best thing, I felt, was something that would support the stretch of the knit while at the same time stretching itself. Elastic. It works like magic in this suit and makes it so that the polka dots don't look all warped in the strap section, plus I think it will really make the suit last for a quite a long time. Last, but certainly not least, I went for more padding in the bust. When you're a small busted lass its nice to add a little oomph whenever possible, dontcha think? I cut up an old push up bra that I'd been saving for just such an occasion and voila! now I haz something to write home about! It's a marvelous feeling! He he! I think that just about does it for this year's outing of my swim suit. Since two years ago, there's quite a wonderful sampling of swim suit patterns coming out the market. Totally recommended from me for a sweet ending to this year's hot summer. Yay! Happy Summer People! The suit is beautiful. I love the green on a ginger! this is so cute! love the polka dot fabric, and the fit is amazing! i like how you modified it for a crossover strap, that would be way more comfortable. i'm with you on hating suits that tie behind the neck! Hope all is good in the sewing-shop-owner world! You are a total babe! :) Love you in that emerald green. Oh it's so pretty! You look marvelous in it and I hope it's not another 2 years before it gets an outing? Also *high five* on those straps! they look amazing and so much nicer than having them dig into you all day. I made this last summer for my cousin. She had the same issue with the torso as well. I'll have to retry! The swim suit looks absolutely amazing on you. I find it so hard to find a swim suit that fits me. I especially love what you did with the back straps. I love the name, "Mint Julip". Perfect! I too am long waisted and abhor the pulling of a neck strap. In fact, I've skipped over this pattern just because of that. I like a bandeau-type top though because of the coverage, and being a full C cup I also prefer a halter style so I might just have to re-think this pattern. The bust gathers are symmetrical, lots of coverage on the chibbers, and your customizations have really worked out. The suit looks amazing on you. Great job! if you offered a class on making that suit, lots of women would come to your shop, buy the fabric, and sign up it. Then we would all look lovely, and you would have money to go on vacation and enjoy your mint julep again :) Classes are where it's at if you own a fabric shop. Teach and inspire! 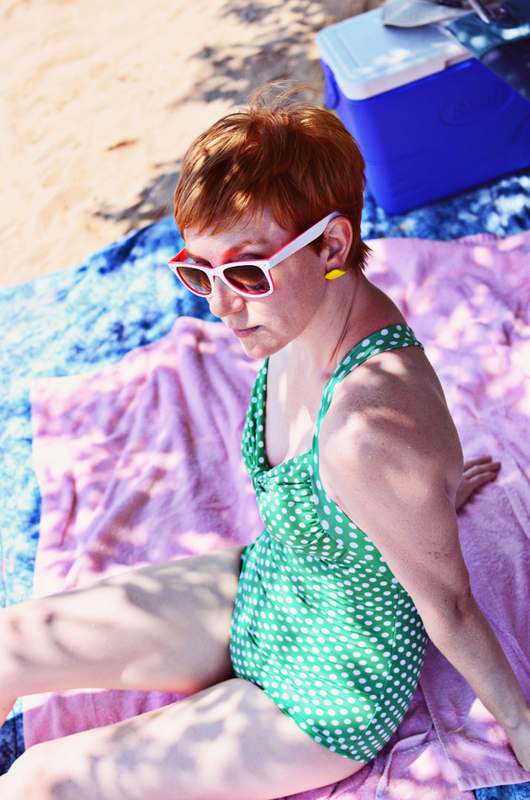 A new swimsuit is on my must sew list for summer. I love your pattern and version of a very very flattering suit. Someone above said you are a 'total babe' - while I would normally steer away from potentially creepy comments...I totally agree! I love this on you Sunni!! 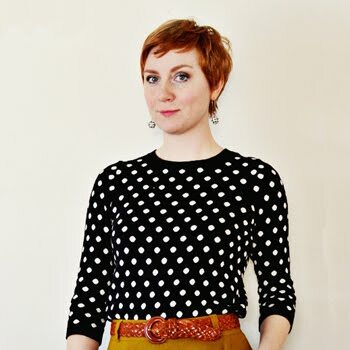 The green polka dots are SO flattering and the adjustments you made to the fit are dead on! Just gorgeous! Enjoy your summer! Oh, this is fantastic! I love the way you crossed the straps at the back. And, the fit looks completely perfect! This is ADORABLE. 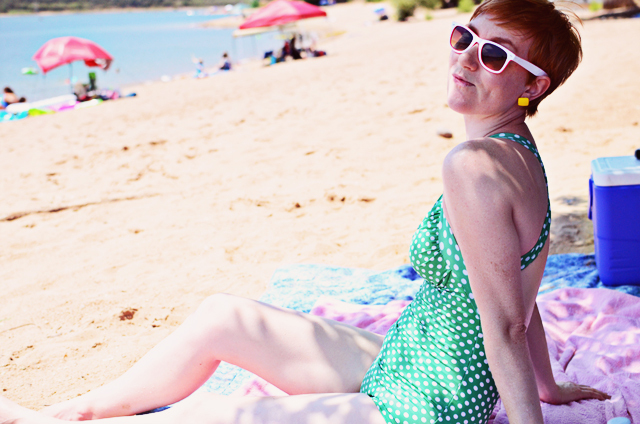 I've definitely never had a RTW swimsuit that fit and flattered like this. And thanks for the idea to use elastic in the straps- such a great idea! Now you have me green with envy! Great job, Sunni! 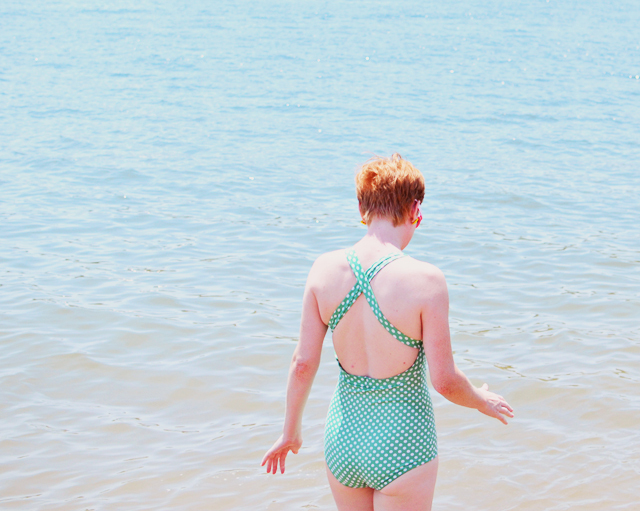 I'm envious that you made a beautiful swimsuit. I think i would be afraid of not getting the right fabric/lining and it's not so much fabric I'd be scared of wasting but my time! You're a hottie!!! And so, so talented!!! It'S an amazing swimsuit, I love it! Such a cute swim suit! You look great!